Certain food evokes the nostalgia of places far in distance. 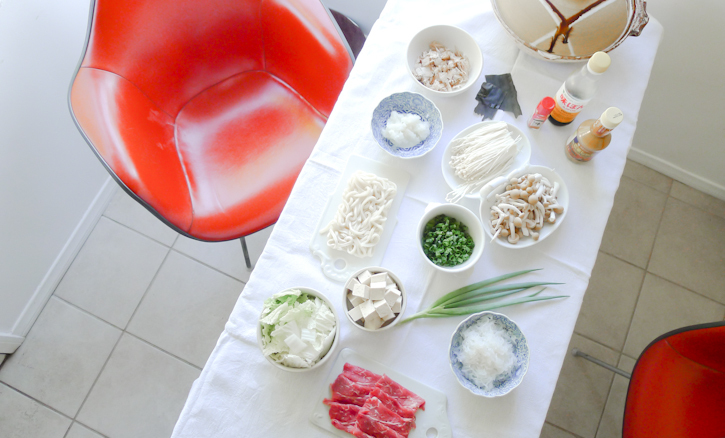 Shabu-shabu is one of these foods that instantly bring us the memory of comfort in Japanese homes... and it happens to be the easiest family style dinner to prepare! The preparation consists of chopping all the ingredients (takes 20 minutes!) and making the initial broth by cooking Katsuo-bushi (bonita flake) and Kombu (thick edible kelp) in Nabe (Japanese ceramic pot) and that's all that need to be done! Set a table with a bowl and a chopstick for each guest along with some condiments and sauce, invite everyone to the table and start cooking different ingredients in front of everyone right on the table using Nabe with a Konro (a portable tabletop gas stove). Shabu-shabu is a great meal to share with family and friends because cooking process is just as special as an eating process and unplanned conversations that happen while waiting for the food to be cooked on the table is priceless. Also the whole meal is cooked in one Nabe on the table and everyone takes what he or she likes to eat from there... so it is a very intimate shared meal. It also makes it easy to prepare food for guests who have special food needs. 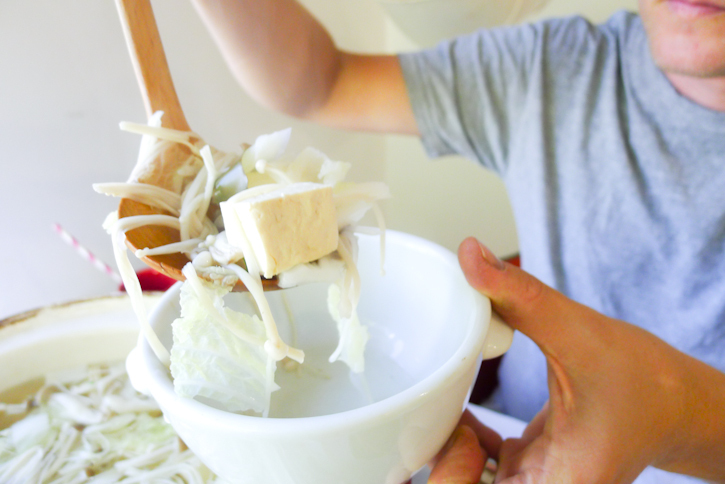 Oh and let's not forget our favorite part... having a chopstick fight to get the best piece from Nabe! 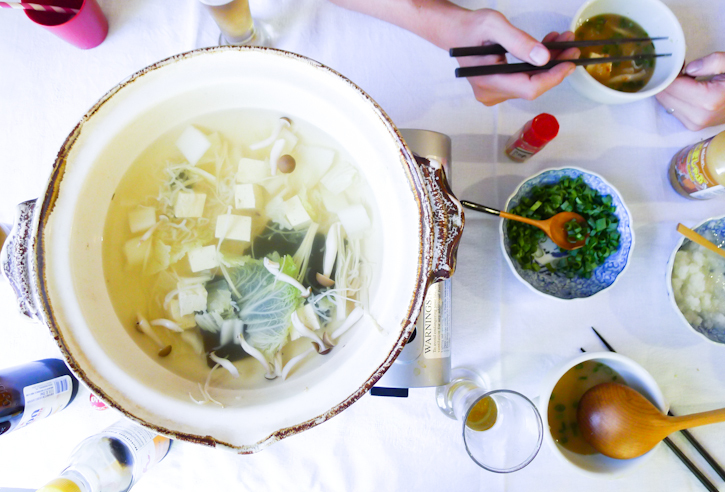 We shared shabu-shabu with our friends on special occasions and noticed that it has a track record of making new "shabu-ers" along the way! 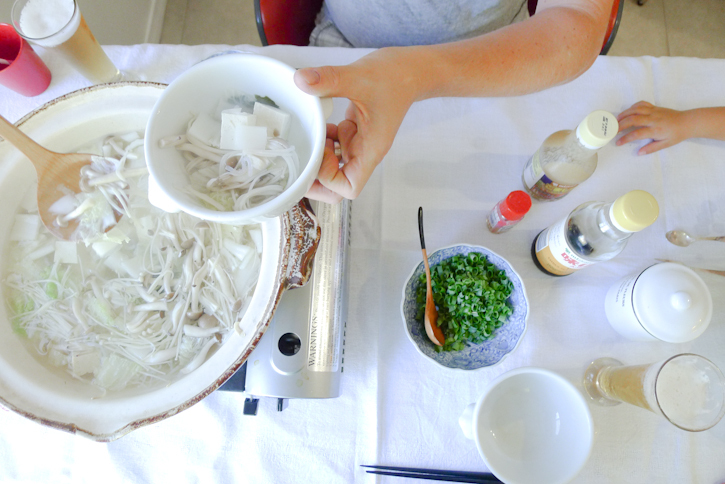 Our friends go to the extent of getting the specialized tools such as Nabe and Konro for their homes so they can have their own shabu night! First course is usually meat since it gives nice flavor to what will be cooked afterward. 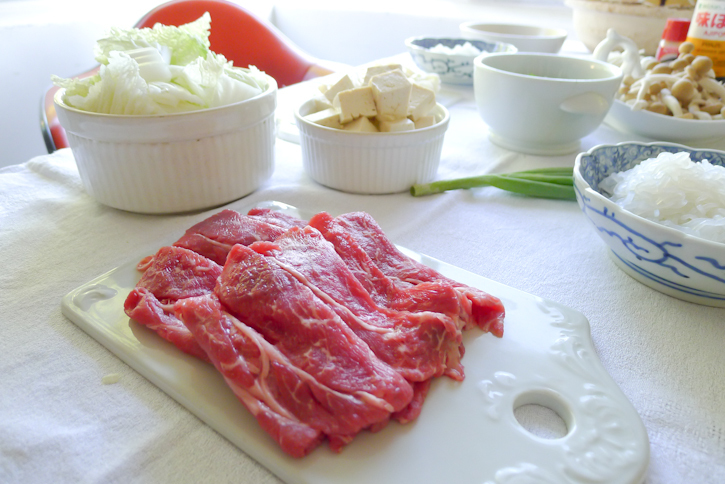 We use very thinly sliced pork or beef which is often labeled as "shabu" specialized meat at an Asian market. If you don't have an access to an Asian market, you can ask a local butcher to slice meat as thinly as possible. If you prefer seafood, clam, scallop, and shrimp would also work! The word "shabu" means "swash" in Japanese. 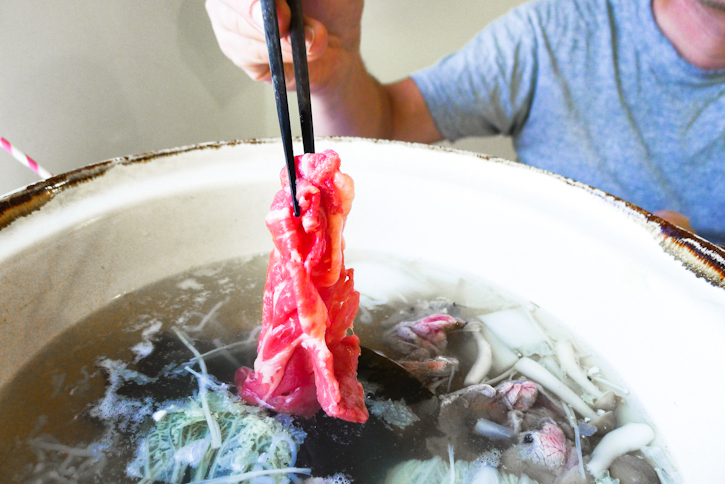 The dish is called "shabu shabu" because you cook a thinly sliced meat with a chopstick as if you are washing the meat in the boiling water. 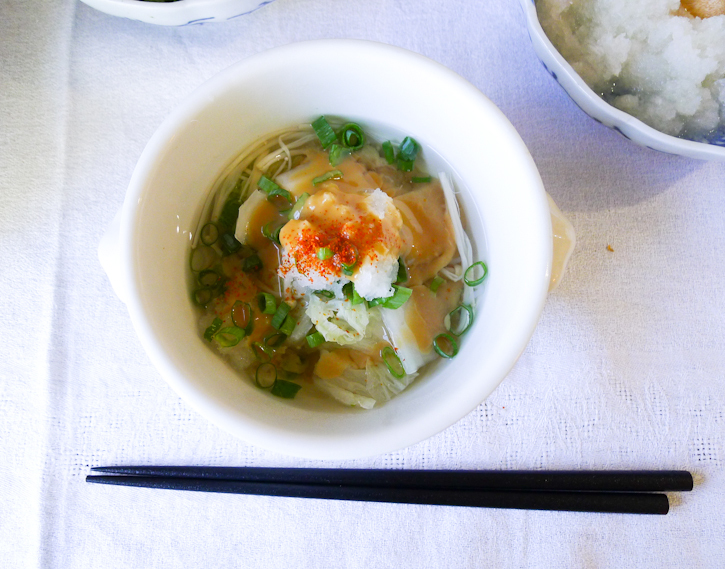 The cooked meat goes directly into your bowl..., add condiments like chopped green onion and grated Daikon (white radish) as you like... topped with Aji-pon (Japanese citrus flavored ponzu sauce) or sesame sauce. 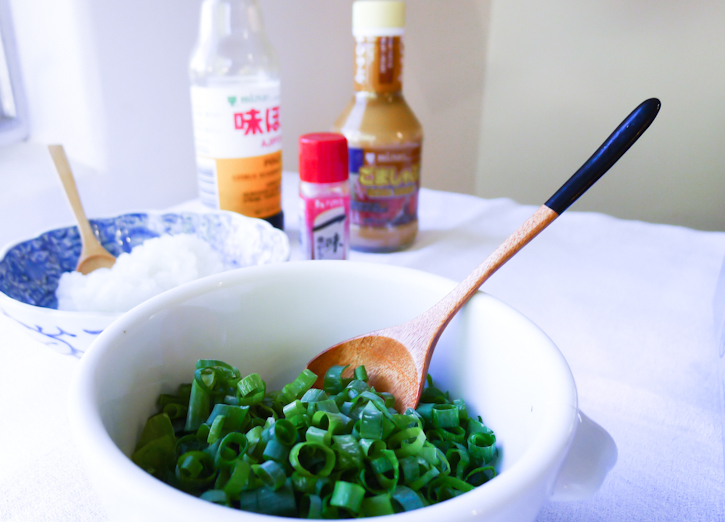 Make sure to spice it up with Shichimi (Japanese chilli pepper) if you like your dish spicy! Second course is vegetables. 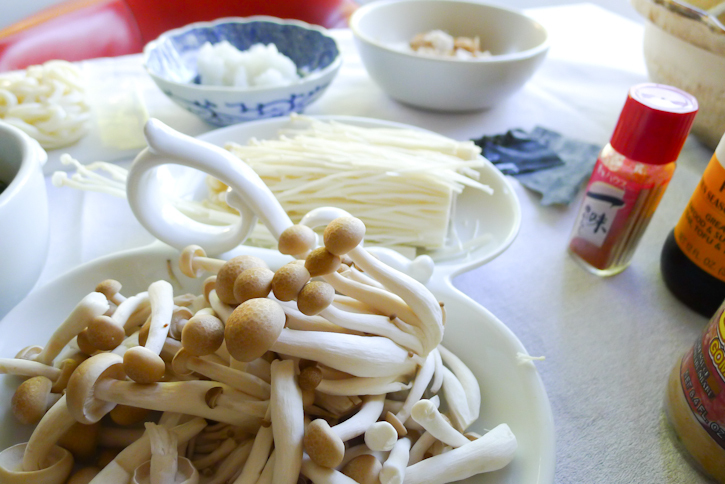 We love including nappa (Japanese cabbage), all sorts of mushrooms, Ito-Konjac and tofu in Nabe and cook till they are ready. The possibilities of what could be a part of the vegetable course is endless. The last portion of shabu-shabu is all about carbs! 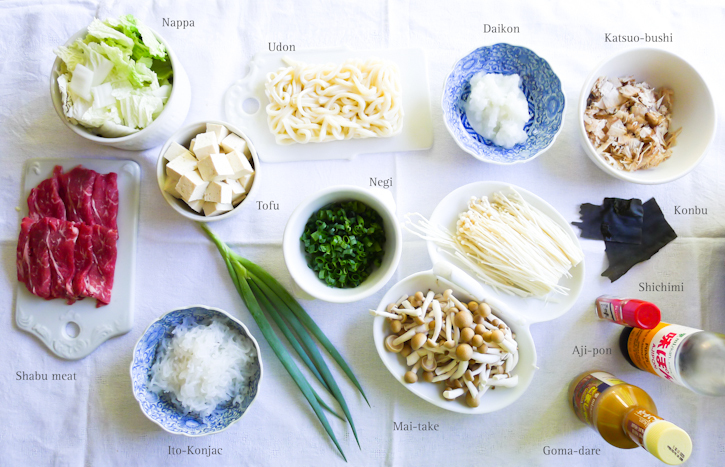 Udon noodle always makes the shabu-shabu to an instant comfort food... then if you still have some space in your appetite, you can cook Mochi (sticky rice) then finish it off by putting few cups of cooked rice in the much flavored stock with little bit of soy sauce and salt! I think Okayu (risotto) soaked in these rich flavor is really the reward for all the hard work that went into making (and eating) this amazing meal! p.s. 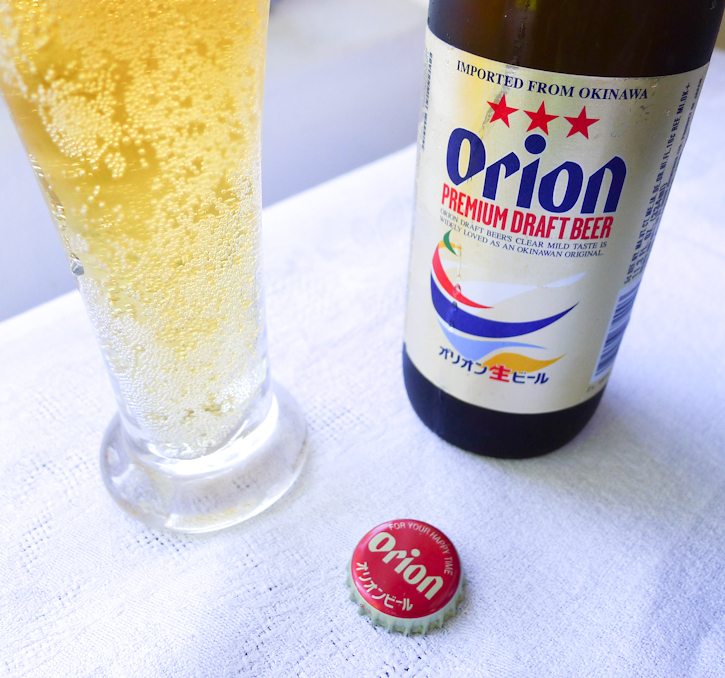 and don't forget authentic Japanese drinks to go along:) We love Orion beer from Okinawa, Japan!